I just made banana nut muffins out of two ripe bananas we had. I used a recipe I modified from Bon Appetit. 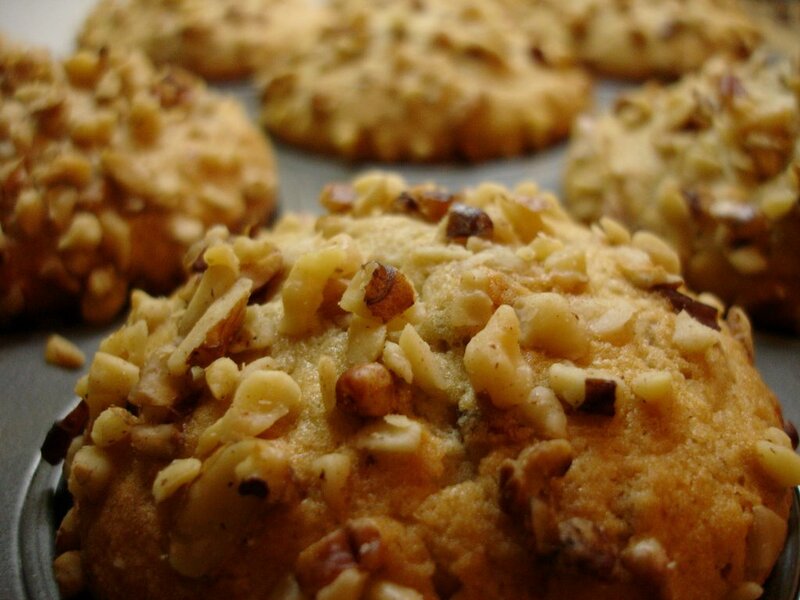 It took me a while, and I toasted the nuts and forgot to put them into the batter until I'd scooped three muffins, and I saved too much nuts for the tops, so they're very nutty on top. Preheat oven to 350 degrees. Line muffin cups with papers. Toast nuts in oven for 2-5 minutes, or until toasted. In a small bowl, mix mashed bananas, milk, and vanilla. Beat butter in a large bowl until creamy. Gradually beat in sugar. Add eggs one at a time, beating well after each addition. Beat banana mizture and flour mixture alternately into butter mixture in a couple of separate additions. Stir in most of toasted nuts and with a scoop, scoop into muffin pan. Top with remaining nuts. Bake muffins until tester inserted into a muffin comes out clean, about 30 minutes. Ooh look. It's a recipe!